Being creative does not require the ‘best’ of materials. It is about freeing up yourself, using your imagination and listening to your intuition. It comes from within and not from what you have. A big question that I already cannot answer. When someone says ‘just be yourself’ I wonder what it is exactly because that sense of myself is really not set. I cannot define it in a way that truly fits me. To my children I am this, to my parents that, to my friends another and so it goes on. (Who am I to myself?) What I do know is that when I am creating a mandala I am connected to myself. Being connected may not define me but I feel the process is about being with me and getting to ‘know me’. Like layers of feelings my self unravels, expresses, is alive - an ongoing realisation. Nothing earth shattering, just layer by layer connecting and trusting the process. Throughout my life mandalas have been popping up and with them have come an interesting series of opportunities to make BIG changes from travel, creating my'home' wherever that may be, entering or renewing relationships, changing or developing my career, altering family dynamics, sometimes recreating myself, and other life shifts. They all required a creative mix of effort, knowledge from experience and most importantly being courageous enough to bring about the changes even if at times there was regret...ooops that was not a good decision. Mandalas have shown me that in some way we are all profoundly linked with everyone and everything in what is called - the dance of life. We follow the dips and the rises, the twists and turns, the joys and the sorrows. By 'living' I am making the commitment to life, the mandala, the whole package and I join with others in the dance. An artist brings beauty into our world because they see things differently. They encourage us to look at ourselves differently, to question, to pause, to be. Artists inspire us to be more creative, they work hard at their craft yet only a few make a good living. They stir us with their passion, enhance our lives and give of themselves openly. To be an artist requires courage, it is not all fun and games, so support an artist. Encourage them when and where you can because they contribute to your world. These different mandala artists inspire me to want to support creativity. I am excited by what they bring fourth, what they share and the wonder of the unlimited creative. Yahoo! Perhaps I lost something of myself at Mt Kailash and need to return to retrieve it and again view some of the most magical scenery on the entire planet. REFLECTING ON MT KAILASH AND WHY. Sacred site to billions of people, Mt Kailash sits in remote far western Tibet, a great mass of black rock soaring to over 22,000 feet. No planes, trains or buses journey anywhere near the region and even with rugged over-land vehicles the journey can be difficult and often dangerous. Unpredictable weather, can be unexpectedly treacherous yet pilgrims have been coming to this sacred mountain for thousands of years just to walk around it. I was one. Incredibly lucky and naïve I embraced an experience that was life changing, challenging and deeply gratifying. Walking around this holy mountain I had no expectations other than to just walk; to be there and share the experience with 5 others. You do not climb this sacred Mountain - you walk around it. It was challenging and we climbed to 5,400 meters without oxygen. Three days later we had successfully walked around the holiest of mountains following in the footsteps of thousands of others. Even as I write this if I close my eyes I can feel that same energy - that maybe the molecules or particles (?) that make up my body are vibrating/moving differently to make a little more space between them. Crazy? Probably. Even though it is difficult to explain the physical feeling it helps in describing emotionally how Kailash effected me. Strong beliefs about life and my self, things that I grasped tightly to feel safe or secure or to have a definite sense of who I am moved a bit, changed momentum. There was more space and less grasping and I was drawn more to feeling, to being aware to just being 'there'. I was not afraid. For a space in time I did not have the need to constantly define myself. Mt Kailash for thousands of years has been viewed of as the symbolic central point of earth. It has four flat faces each corresponding to the four cardinal points. Like a mandala itis a center from which everything emerges from and connects to. For more information on Mt Kailash. Travelling lets lose my 'other self'. It is when I am free from my every day life and free from my every day self. I feel open open to new ideas and experiences. I am ready to explore. Time becomes the moment instead of being filled with what must be done and what I still have not done. There are periods of stillness, of just being. I could be waiting for a flight, sitting in a bus, or watching an awesome sunset. At those times I can reflect on my life up to now and just connect with who I am. This is traveling into myself because I am with myself and not just my life. I connect to a sense of transition - that life is ever changing and so am I. Impermanence. For me this releases the tension of needing to remember everything, of being in control, of being responsible, of having to hold onto life. If life is a journey then I want to be a tourist. turf maze, UK maintained by villiagers for centuries. CREATIVITY AND CREATING A MANDALA. 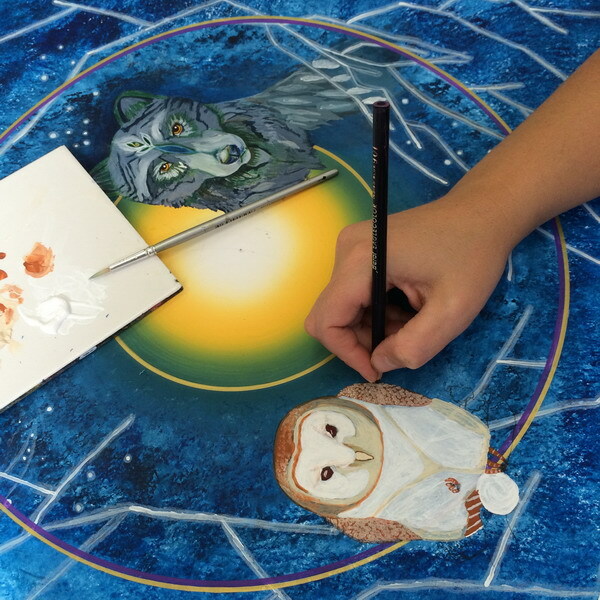 Julia Cameron, a mandala artist, says, "The creative process is about surrender, not control." 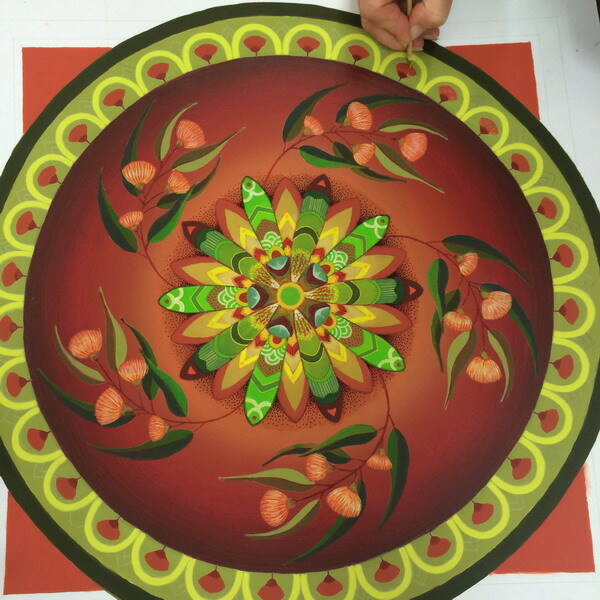 Creating mandalas is simple and yet complex. By understanding the creative process I have learned more about the depths of this fascinating art. The creative process according to psychologist, Dr. E Paul Torrance is described as "a process of becoming sensitive to problems, deficiencies, gaps in knowledge, missing elements, disharmonies, and so on; identifying the difficulty; searching for solutions, making guesses, or formulating hypotheses about the deficiencies: testing and retesting these hypotheses and possibly modifying and retesting them; and finally communicating the results." I believe that when we create mandalas we encounter this process as well as tapping into the vast resources within our unconscious, the collective unconscious and more. That is AWESOME! Creativity according to ancient beliefs was something that God alone possessed. Humans were not considered to have the ability to create something new except as an expression of God's work coming through them. In the Greek and Roman culture creativity was also linked to the sacred or the divine. It was a process of mediating inspiration from the Gods. Later in history (Renaissance) creation began to be perceived as having originated from the abilities of the individual, and not just God. Perhaps it is both? Creating mandalas is an ancient art form which is also like a conduit to the divine. We connect with a deeper spiritual aspect of the self and express that through art. There are steps or phases of the creative process and they may not always be taken in order depending on the individuals make up. 1. 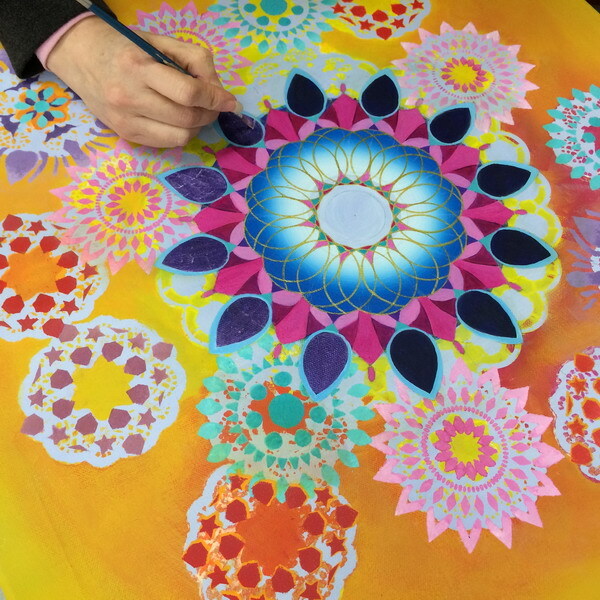 Preparation – mind work, meditation, connecting mentally with the challenge to create a mandala. Setting in motion the thought processes of the desire. 2. Incubation - where the problem is internalized into the unconscious mind and nothing appears externally to be happening. "I cannot see it - yet"
5. Verification - Making it happen. The idea is consciously verified, elaborated, and then applied. This may seem to be daunting and yet we encounter this process as easily as breathing. The creative spirit is part of who we are and it naturally expresses itself when we give it the opportunity. We all start with a blanc canvas. We all start from the same point. We are equal. It is important to recognize and set free our inner artist. Know that everyone expresses out art differently, uniquely. There is no competition. We do not need to compare our art to that of others. There is no judgment of our own creativity or that of others. Instead of using thoughts or words we will allow ourselves to express through images, colors, shapes and symbols. We experiment and explore the concepts of a mandala :- segments, geometry, lines, shapes, colors, divisions and connections, patterns and repetition. Try not to ‘see’ the finished product and let your creation unfold, develop and grow without the restrictions of expectation. Mandala art is not about rules, should dos and musts and getting it ‘right’. Expectations can ruin the outcome. They belong in the future and we remain in the present. Remember that your hands are the tools. Your eyes are the seekers of light, shade, shape and wonder. Your imagination opens the door to unlimited possibilities. With an open mind you can explore the unknown and express your HeART in art. You cannot pour from an empty cup. We need to replenish from the inside out. By nurturing and supporting the relationship with our ‘self’ we are able to have healthier and happier relationships with others. Temporarily retreating from the habits and demands of ‘everyday life’ gives us the space to take a fresh look at our lives, to re-connect and nurture without distractions. Being separated from our everyday life gives us the space to be present and aware of our body and what it needs. We have time be involved in what we are doing. Each moment is a joy because we are not pressured by thinking and re-thinking about what needs to done next or worrying about what we have not done. Finally we release stressing about every little detail of our busy lives and relax. Truly relax. Joining with others who are committed to improving their lives, interested in personal growth and embracing new experiences is inspirational. You may create new friendships that support, uplift you and inspire you to be the best that you can be. Through creativity we deepen our self-awareness to discover our true heart’s desire and soul’s yearning. Being involved with different activities, places and people during your retreat exposes you to a different way of being you. This experience will leave you feeling more present and connected to who you are. Fully immersing yourself in a retreat experience really supports long-term change. To feel energized and re-vitalised sometimes you just have to get out of your current environment to see what needs to shift. You have the space to find clarity in your life. A retreat provides you with opportunities to nourish for your outer self, which in turn nourishes your inner well being. Take a Yoga class. Indulge in healing massages, facials, manicures and other beauty treatments. Caring and lovingly treating your body works wonders for ‘you’. Taking a walk in nature and enjoying the stunning beauty of all that the natural world offers is in itself very healing. By sitting in nature you connect with the nurturing power of the earth itself to ground and reset your inner harmony. The more we make time to prioritize self-love and self-nurturing practices into our lives, the more EVERYONE benefits. Can you make the time? Organize something that is just for you and take a small break from your life, loved ones and or work, to be with yourself for YOU. Retreats offer you the space to truly care, nourish and love you. Re - fill your cup. You are worth it. that we create art in order to convey to observers that behind the visible lies a hidden world of ideas that can shape and change the visible world. DEALING WITH DIFFICULT PEOPLE IS AN ART TOO. Everyone has to deal with difficult people - often on a daily basis. We find them at work as customers or co-workers; in our family as children, teenagers, parents and spouses. Even our friends can react emotionally to situations. Everyone gets frustrated with the life’s limitations. We can be difficult to deal with too! The way you handle it depends largely upon the relationship that you have with that person. Keeping calm and clear headed and staying rational when people are being difficult is easier said than done. Emotions make it tricky. By understanding what motivates people to be difficult can help. Here are a few tips. By being difficult we can get what we are after. This might be being heard, respect, attention, letting off steam, feeling important and valued, being understood or having something made right or fixed. By giving them what they want can satisfy their need and stop the behavior or it may inflame them making it worse. 2. Do not take it personally. Filter out hurtful remarks, attacks and criticism and listen to the facts and other useful information. Angry people often see their emotions as facts. Use these steps to defuse the situation. · Tell them you appreciate them letting you know. Make sure your self talk supports you. Do not put yourself down or let you get put down. When we are under threat we often hold our breath. Try to relax. Breathe deeply and give yourself more oxygen to think clearly. Make the space between you comfortable or change position if you need to. You may need to take a break or walk away to diffuse things. 5. Focus on a win/win outcome and be flexible to get it. Keep your ego under control. Do not seek to win. Look for a good outcome overall. Do not seek to punish. 6. Listen - acknowledge that you hear them AND understand their point. Difficult people generally feel unheard, ignored or not valued. They can start shouting use abusive language, over exaggerate and generally get in your face. Show them you are listening – really listening (don’t fake it) by using appropriate responses and body language. When a person feels heard they often settle down. 7. We cannot change another person but we can change their behavior. You are not trying to fix the person. Deal with the behavior. Their bad behavior is the problem and not them. Make sure they get that message too. 8. Be aware of what you say and how you say it. Even though it may be really hard to do, be polite, courteous and reasonable. Sometimes silence is Golden. Bite your tongue if you have to. Keep your responses clear and simple. Angry and upset people cannot take in much. Difficult people often have less abilities of communication. Keep your tone even, stay calm and say less. 10. Do not give away your power. Many of our issues with difficult people come from the fact that they have very different beliefs from us or very different ways of communicating. Some people are just plain difficult. Accept it. 11. Don’t gossip or complain about the person. Avoid complaining, going on and on about what they said or did unless you’re truly discussing the situation with an eye towards finding a solution to the problem. Getting yourself worked up and creating more negativity around the situation does not help. Stop doing that and you’ll find that some of the bad feelings dissipate. Many of us hang on to grudges towards the people that have been difficult in the past. This makes it hard to move on to a better relationship with them in the future. Learn to forgive and let go and work from this point forward. Even with the best intentions sometimes we cannot always get it right. Be kind and compassionate with yourself.... your best efforts are the best. Smile. Art is everywhere - you just need to look. From the minute to the magnificent it surrounds us and fills the crevices of our busy lives with joy; with inspiration. My garden is one of those places where art lurks ready to catch my attention and pull me away from my every day life concerns. For the past month we have been working daily and often until dark getting out garden ready. Getting it ready to delight, to entice others to discover and explore the beauty of this wondrous place. Why? Because it is a place to share. We support our local fire brigade with the funds raised and we understand that such a special place supports the artist that is within all of us. SO much to see, to feel, to smell...to inspire. The garden is a great and endless giver. You just need to look. Floating on a small barge at sunset listening to the boatman sing. Perfect moment. The dilemma - YES. were back from INCREDIBLE INDIA. We really, truly had some incredible experiences. We saw extraordinary things, witnessed what is too hard to articulate; felt and observed contrasts that challenged our life values and expectations. All 8 of us were moved to your very core. We cried, laughed and were often just plainly overwhelmed. Of course we are VERY excited to share our experiences with you, our friends and family. The whole adventure has changed us and we feel different but the problem is, everyone else is exactly the same. And not only that, they think that we are just the same, too. So how can we relate? We know that people only want to spend so much time (not much really) hearing stories and looking at pictures. They probably savour the ‘worst bits’ which isn't the go ahead for a two hour discourse. So we need to refrain. No matter how fascinating, incredible and exciting our experience was at the time – we were there and they were not. Not being present makes a difference to how you feel and nobody likes to feel left out. India is inexplicable and not really a ‘regular holiday’ destination. A priceless opportunity that isn’t necessarily available or even appealing to everyone (even though we might wish it was). We notice that we have begun new things such as breaking into song, eating a lot of curries, wagging our heads, raising our arms, smiling for no reason and wanting to meditate more often. He he. Just some of the ways in which we try to integrate our new knowledge into our life at home. Sadly, we can’t bring it all back with us nor can we share it all. One of the most exciting things about travelling in a group through India is being exposed to different tastes, perspectives, and practices. Sometimes when we return this means re evaluating our own life and our appreciation of what we take for granted – homes, water & food, safety, family etc and a huge range of things that differ greatly between our world to that of the streets in Kolkata or Delhi. So we have sponsored more children at a school in Sarnath in the impoverished state of Bihar, because a small thing DOES make a BIG difference. (no need to go on about it – just do it). It can be challenging to re-settle back into our ‘old life’ and perhaps we never will. But we keep alive that eagerness to learn and explore and feel in the moment here at home knowing that at any time things can change. Most of all we look to live, love, laugh, and be grateful for our family and friends and all that we are blessed with. We know that there really is only today. There is magic in my garden - I know it. Watching people explore, sit, photograph and wander through the different levels as they descended into our garden to return with smiles and such positive comments was inspiring. It made the days of sweat and sometimes tears as we prepared for an Open garden all worth while. We were astounded at how it came together, the transformation of slopes and piles of rocks into sculptured terraces and winding pathways. Many days we kept working till darkness came and we climbed back up the hill to rest before returning in the morning. Thank you to everyone who helped, who visited and supported the weekned. It was a fantastic experience. We are opening our magical garden to the public for one weekend as a fund raiser for our local CFA. Joined with two neighbors this garden experience is just that bit more magical. This year our theme is ‘Aqua’. Latin for water we see our garden as a place for reflection, stillness and connection. Our special addition is the turf maze or Labyrinth for you to explore. Mandala mosaics are set in pathways leading through arches into the neighbor Sonja’s native garden. Here the local rock features add a unique quality with a vegetable patch that feeds the both families. Walk across the road to view the superb garden of Elly & Leon Roos who are experienced gardeners happy to share their extensive knowledge. Their garden lies on the other side of the ridge facing north. It offers a paradise of colour and lushness specializing in Salvias and other rare plants. Explore and enjoy beautiful sitting areas with vistas into the Dandenongs. Turf labyrinths, or 'turf mazes' were once found throughout the British Isles. Formed by cutting away the ground surface to leave turf ridges and shallow trenches, a single pathway leads to the centre of the design. Dated to the 16th and 17th centuries only 8 survive in the UK. There has been much speculation about why turf mazes were cut and what they were used for. Modern turf mazes are used to aid contemplation or meditation, much as a mandala would be. We were inspired by discovering many of them in the UK, walking and experiencing this ancient art. Our Labyrinth is a medieval design as found on the floor of Chatres Cathedral in France. You are invited and welcomed to a garden experience - something different, something unique. Bring your friends and have a devonshire tea in a spectacular setting. Cats are associated with intuition and the magical, mystical side of life. Felines represent the feminine part of our nature, our sensual and sensitive side. The cat is independent and has the ability to see in the night, symbolic of the insights to be discovered deep within the unknown part of the self. Here, the black cat, represents the dark side of our secretive self which we fear and yet are drawn towards. The soft white cat is the playful, inquisitive one. You are guided by a strong sense of knowing. There is no need to constantly analyze and intellectualize searching for a reason why. Go with your gut feeling even if others cannot see the sense in it. Trust yourself. The situation may require a less serious approach so try to playfully work it through. Cats are fabled to have nine lives so there is plenty of opportunity. You can afford to take some risks. You ‘know’ what to do. AFFIRMATION: I am connected to my own inner vision and I am listening to the voice of my intuitive self. White Cranes Mandala. In China the upward flying crane symbolized aspiration. The white body of the crane represented purity and its’ red head was the fire of life. This ancient symbol has long been associated with birth, regeneration and resurrection. It is the symbol of life itself. The swirling central cranes bring our focus to the heart of the mandala, that magical place where new life begins. Depicted as a Yin Yang symbol it represents the primal opposing but complementary forces found in all things in the universe and the necessity of balance. It is a place of two opposites uniting and yet remaining separate. 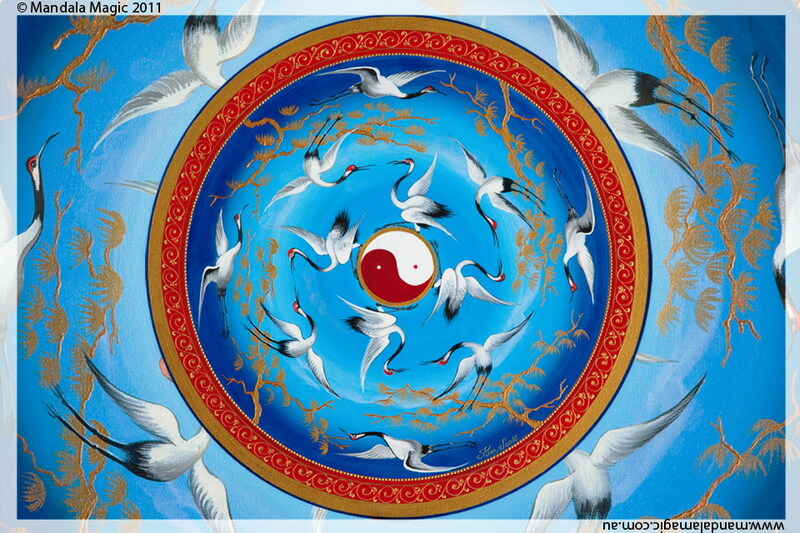 It is here that the masculine (white) and feminine (red) energies come together in a perfectly balanced state. This mandala reminds you of the universal principle of ‘opposites’. Joy and sorrow, masculine and feminine, light and dark, fearless and afraid, and all the other differing aspects of yourself that connect you to the power of creativity; they inspire you to question, to explore, to reason, to make and create. You are aware of the differences and contrasts between you and your loved one – there is opposition. This brings balance and power to your relationship. This mandala also brings news of renewed life or the birth of a special child. AFFIRMATION: My consciousness expands to embrace a deeper understanding and acceptance of those that I love. My relationships are harmonious.